Spring is in the air! Just kidding. As I write this, I am actually looking out a window to slush-filled streets, piles of dirty snow chunks, and ice-covered trees (at least that part is beautiful). Sure, I love snow days and hot cocoa and the earth giving my husband and I a proper excuse to just sit at home in our pajamas eating junk and binge watching our favorite TV shows, but the more inconvenient this weather becomes, the more ready I am to rid everything in our house that reminds me of winter and brighten things up! If you are in the same boat as I am, then we have some great ways to cure your cabin fever and give your home a fresh life! Fresh flowers are always a wonderful way to bring spring indoors. Sadly, it is very difficult to find beautiful flowers around here without paying an arm and a leg for a fancy arrangement done by professionals, unless you have a luscious garden full of blooms to choose from. A friend of mine from St. Louis was talking about his DIY hydrangea centerpieces he created using fresh, inexpensive stems from Trader Joes. I remember nearly drooling in envy and wishing that our small town would at least have some place where I could go pick up a few stems of peonies, hydrangeas, and cabbage roses any time I want. However, you can make a more simple, yet beautiful arrangement with the basic flowers from the grocery store. They key to having your arrangement look high-quality is not only how you arrange it, but also what container you put it in. To have a classy look, keep all of the flowers the same (like a dozen white roses or a dozen pink tulips) and leave the greenery and filler flowers to a bare minimum. Simple, glass or crystal vases are usually the best vessel for a more sophisticated look. I love transparent containers! There is something about how the water makes the stems look that makes me so happy. If the vase is transparent, make sure to always de-leaf your stems for a cleaner look, unless the leaves are just as beautiful as the blooms like the tulips above. For a more rustic, organic arrangement, add as much filler as you want. Antique containers (milk bottles, flour canisters, garden pails, etc.) work really well with a more free-spirited style. If you really want to be practical, buy potted plants and put them in a gorgeous pot. Instead of waiting for the spring greens, why not bring them to you? Faux greenery (when it doesn’t look too artificial) is a wonderful way to bring some color and freshness into your home and we’ve got it. I just adore these bundles of boxwood and I LOVE LOVE LOVE adding simple greenery to a neutral space. Just look at how good this faux boxwood looks with our French garden and French farmhouse accessories! I think my heart literally skips a beat when I see this kind of stuff come together! 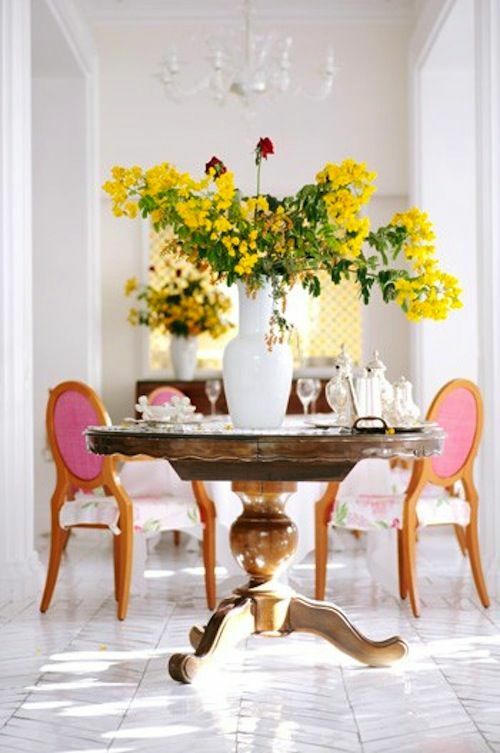 I don’t think there is any better way to bring a little more spring into your home than this! Painting is the best way to change up the way your home looks. Just painting your walls a brighter or lighter color can really change the mood of your entire home. If you’re really brave, painting some of the accents in your home (cabinets, furniture, outdated backsplash tile, etc) can also make a huge difference. Our paint products are so easy to use and have little to no odor so you can paint inside your home. Unlike latex paints, with our paints you don’t have to sand down to the wood or prime (unless you’re painting with a white) and you don’t have to worry about chipping and peeling. You can even paint metal, veneer, glass, and many other materials. We also have antiquing glazes, gel stains, and metallic finishes to add even more character to your projects. For those of you who like to play it on the safe side or are currently very pleased with the color scheme in your home, try sprucing things up in smaller doses. Add some colorful, patterned pillows to your couch or replace your heavy drapery with some airy curtains. Well, the view out of the window hasn’t improved, but my mood has! With the fragrance of the beautiful tulips next to me and these ideas in my head, I am ready to defeat this winter and MOVE ON to spring! Hopefully you are just as inspired to do the same. See you next time! Decorating your home should make you happy. You should be surrounded in things you love to look at and things that evoke good thoughts and most importantly, things that reflect who you are! 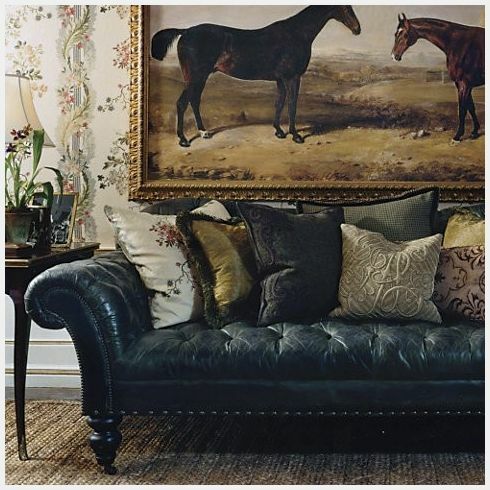 However, as much as you love one certain look, it is always fun to incorporate different styles into your home. For instance, in this region everyone is obsessed with rustic decor. It is appropriate decor for our area and can be very beautiful and unique. However, it can also become very predictable and cookie-cutter, which is defeating the purpose of having a home that reflects who youare! Think about your personal style. Is there another side of you that needs to be shown in your home? Believe it or not, certain styles that are complete opposites can actually look great together! Just see a few mash-ups for yourself. Feminine women of Missouri, I know many of your husbands have a lot of say as to what you put in your house. 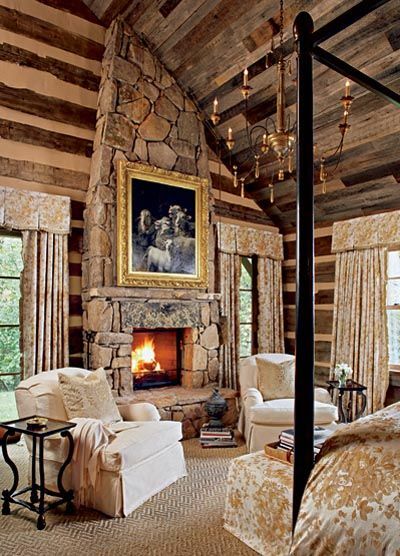 For some of you, you may be limited to having only antlers, animal hides, or rustic woods with little to no compromise. Or, if you are like me and love rustic touches but also love the opulence and grandeur of the more elegant styles, then I am about to tell you something that will make you jump for joy: you can mix it! Pretty things don’t have to completely take over your house, but a little can go a long way and can add just a bit of intrigue. Even if you add just a whisper of femininity with a pretty chandelier, a floral fabric, or a delicately embroidered pillow, you can give your room- and maybe even your marriage- a little bit more balance and harmony! If you are on the other side of the spectrum and your husband’s tastes are a little on the silent side, there are many ways you can add masculinity to a feminine area. 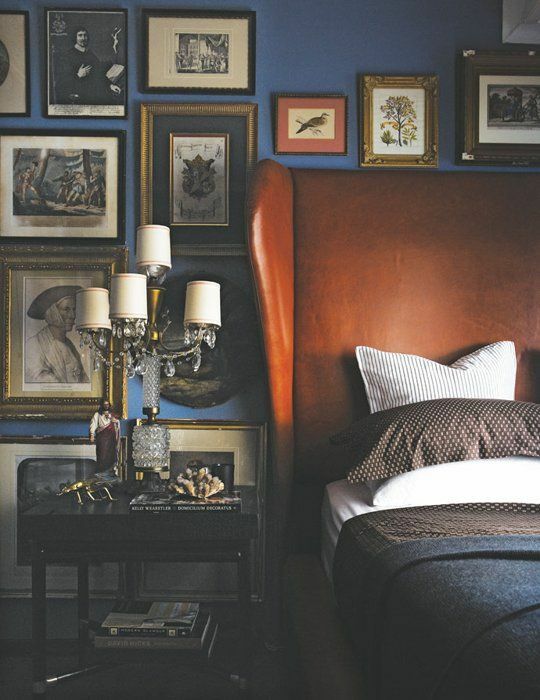 Leather is a great way to add masculinity to a room! 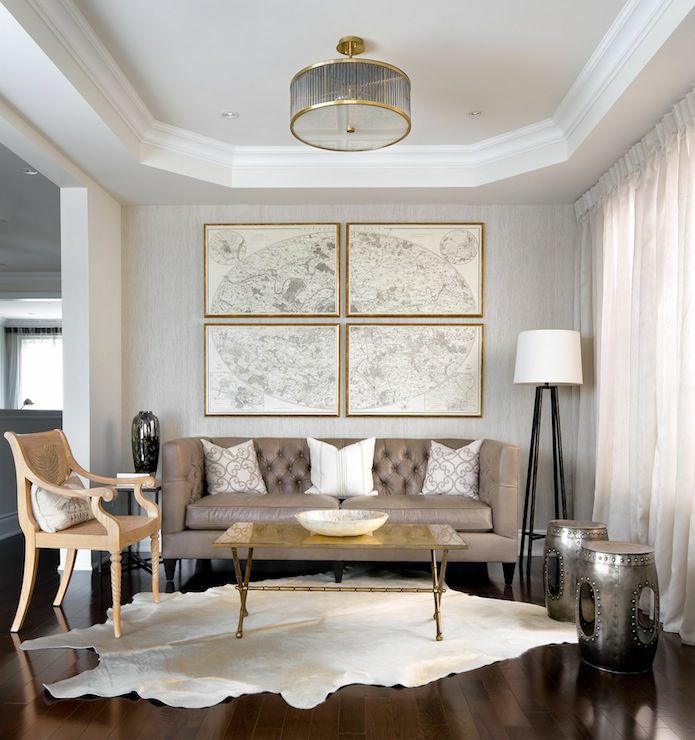 It doesn’t matter if you have floral wallpaper, sequined pillows, or crystal vases full of pink flowers, adding a gorgeous piece of aged leather furniture will really man up your room. Make your man even more happy by throwing some faux fur pillows on the couch or hanging a masculine painting in the room. 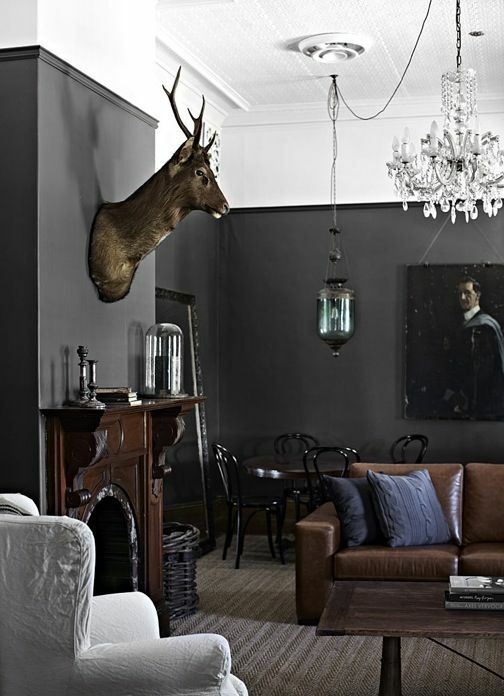 If you are really adventurous, add a cowhide rug or taxidermy mounts. They are both starting to pop up in just about every type of decor style this year. Rustic decor doesn’t have to completely consist of DIY pallet projects and burlap. Adding some clean, modern accents will bring a more stylish and updated look to your home. 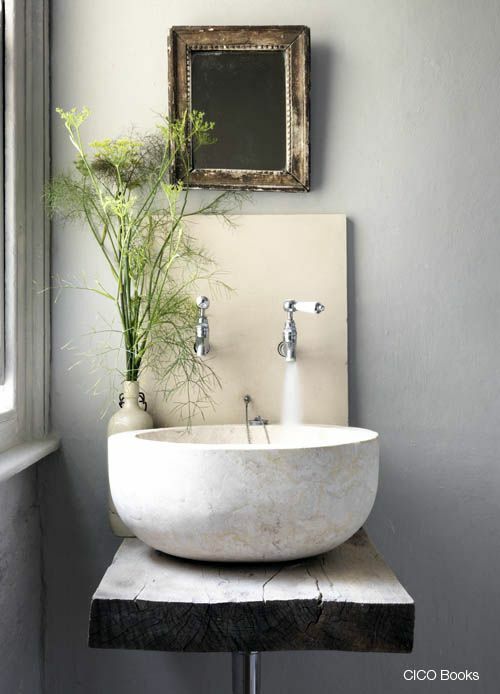 This can also apply if you have a modern home but wish to add rustic elements. The photo below features a beautiful, modern kitchen with a rustic table adorned with farmhouse accents and open shelves full of antique kitchenware. Don’t exactly love the sleekness of modern style? 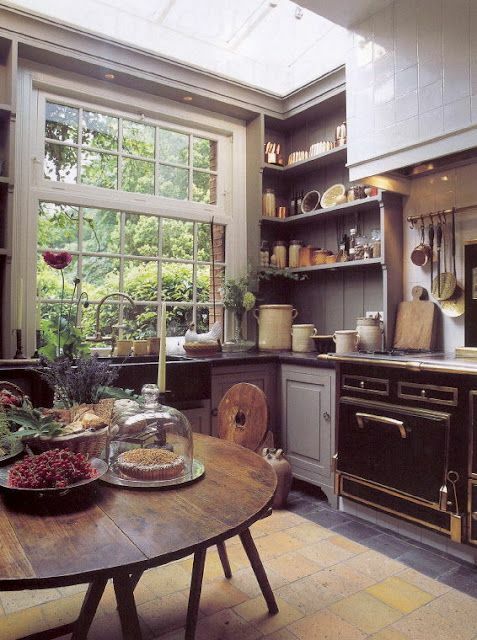 Rustic also mixes well with a more vintage, industrial style, which can be as equally cool as a modern look. This look is so unexpected and quite fashion-forward. In the picture above, this room has everything it needs to be classified as traditional: classic molding, a beautiful crystal chandelier, and a gorgeous stone fireplace. Even the wingback chair is a traditional piece of furniture, but choosing the bold stripe for the upholstery really gives this room it’s trendy vibe! Like the black room, this room has many traditional focal points: the Chesterfield sofa, ornate fireplace, small-planked hardwood floors, etc. However, the designer chose fun, trendy colors for the walls and for the accent furniture as well as clean and simple art. What a perfect balance! As you can see, you shouldn’t be afraid of mixing two styles that you think would look good together. If in doubt, start small. If the item you bring in doesn’t work, simply take it back and keep trying other styles! Hopefully you will soon discover another side of your taste that has been hiding all along! This is the most perfect season! You walk outside and relish in the beautiful weather because it is bright, colorful, and exciting. This weather has everything needed to create a fun and cheerful environment, right? But what happens when you turn around and walk back into your house? Are you welcomed by that same atmosphere or are you ascending into the deep abyss that is a dark and dreary home? Sure, when fall and winter come everyone wants warmth and comfort with lush throw blankets, dark and warm colors, and tons of soft lighting, but this season is a time to freshen up your home! If you have no idea where to start, you have visited the right place! We love getting to refresh our homes and our store and we want to share with you how it can be done! Neutrals and earth tones are always timeless and classic, but a way you can really add a lot of character and liveliness into your room is with fun, bright colors. If you are really wanting a big change, you can paint your walls or bring your favorite vintage find here for us to paint. 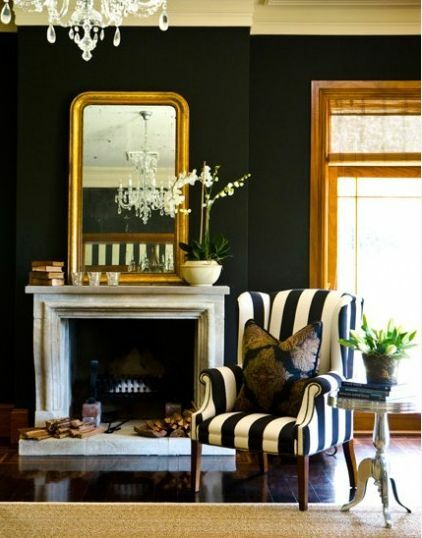 Even if you have dark walls, a brighter piece of furniture will really lighten up your space. Below are some of the great colors we have here at Reblessed. To see all of our available paint colors,click here. If you are not really wanting to make major changes to your home, you can still incorporate this concept on a smaller scale. Try switching out your dark accessories with lighter ones. We can paint everything from picture frames, to candlesticks, to lamps. White is as fresh as it gets! Sure, when done the wrong way, white can be very boring. But when done well, white can be absolutely wonderful! The same principle apply, white can be done in huge doses, or small. It is up to you! I, myself, love an almost all white room. It’s so visually striking and clean and lets the really special things stand out. Now the rest is up to you! Go outside, get some inspiration, and come visit us for some must have lighter and brighter decor!